We love seeing our Best Home Fashion products in beautiful spaces in homes across the country, but nursery room and children’s spaces are especially sweet. We love to work with interior designers and parents-to-be to pick the perfect accent pieces for any type of children’s rooms: modern, traditional, ultra-cozy or extra glam. Dancing With the Stars dance pros Peta Murgatroyd and Maksim Chmerkovskiy, along with their New Jersey-based celebrity nursery designer Vanessa Antonelli, envisioned baby Shai’s first bedroom to be a soft, calming space infused with hints of plush, royal luxury and the lucky charm of elephant accents throughout — and our Mongolian Faux Fur Pillow and Luxe Pom Pom Throw in white fit right in. The room feels natural and airy with its cream, white and gold color palette, but hints of the baby’s VIP status are brought to life with our cozy fur accents. 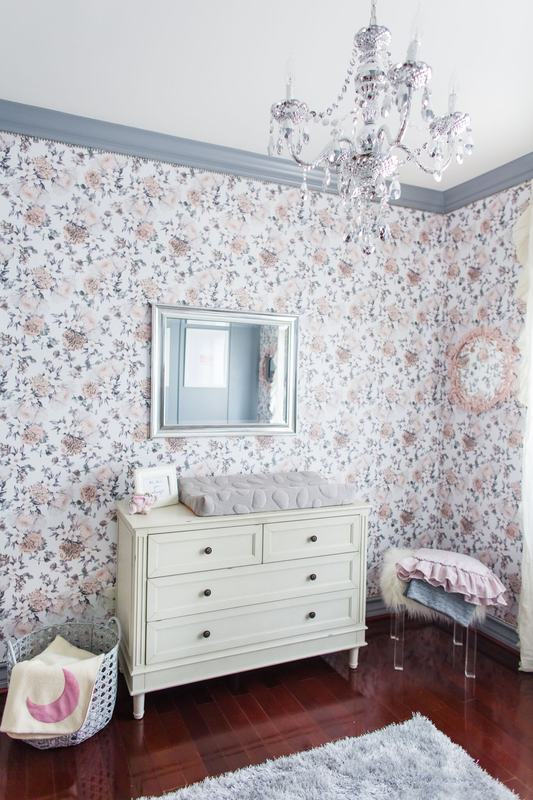 When television and film Actress Lacey Chabert and Antonelli set out to create a perfect “pretty in pink” room for her little lady Julia, they wanted a feminine, romantic finish that both mommy and daughter would love. The finished product is a traditional space made modern with a grey, pink and white color combo adorned with dainty details like our Faux Fur Acrylic Table, a crystal chandelier and floral wallpaper that wows. The Faux Fur table is used as a stool for extra comfort when mommy and baby are relaxing and adds texture and a hint of cool to the super sweet setting. 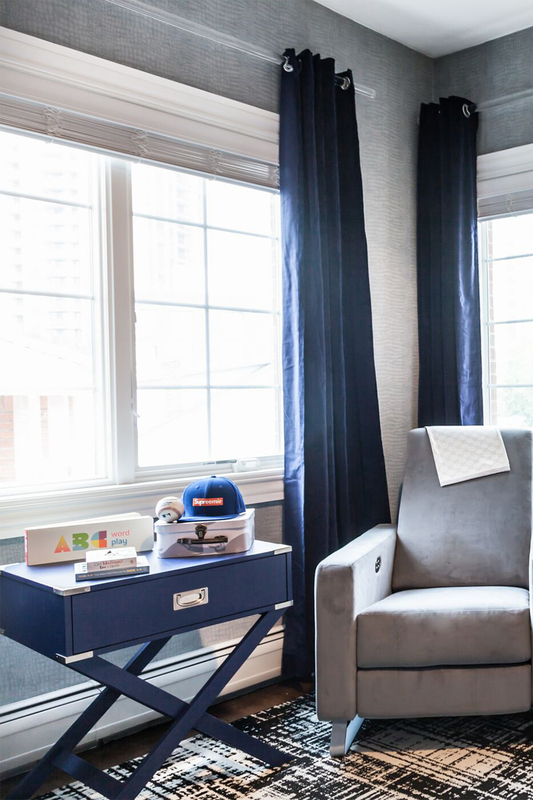 For Angela Simmons’ contemporary cool boy’s nursery, Antonelli incorporated fashion and function with our Navy Velvet Blackout Curtains. 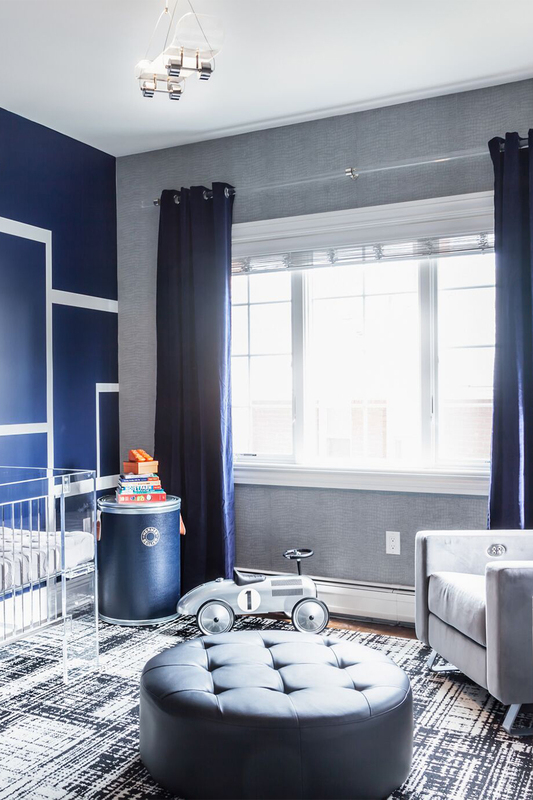 The dark, rich panels fit in perfectly with the room’s masculine, modern design and help mommy ensure privacy and comfort for baby Sutton at all hours of the day and night. The designer paired the panels with modern acrylic curtain rods for a light effect that catches the eye and makes the room’s high ceilings stand out. Whether you’re a notable name or not, every child is a VIP and we love how chic, simple accessories can bring their personal spaces to life and give them personality. It can be a bold statement piece, a sweet accent pick or a neutral favorite that will grow alongside them every step of the way. Any way you envision it, we’re happy to bring it to life.